Arts, Beats & Eats 2016 kicks off today in the streets of Downtown Royal Oak. Now in its 19th year, the festival will feature live music from over 200 performers, an art show, and great food from Metro Detroit restaurants. This year the festival will have live music on 9 different stages. Some of the highlighted acts playing throughout the weekend include Joan Jett & The Blackhearts and Buckcherry on Friday night, JR JR and Our Lady Peace on Saturday, and Three Dog Night on Sunday. In addition to the big national acts, a ton of great local acts will also be hitting the stage. Some of the bands playing include Flint Eastwood, Boudoir Noir, Kaleido, The Gasoline Gypsies, Matt Wixson's Flying Circus, Nina & The Buffalo Riders, Twistin' Tarantulas, Go Tiger Go, Stone Clover, 1592, Emily Rose, Bill Grogan's Goat and many more. Check out the full schedule of bands and find out when everyone is playing here. 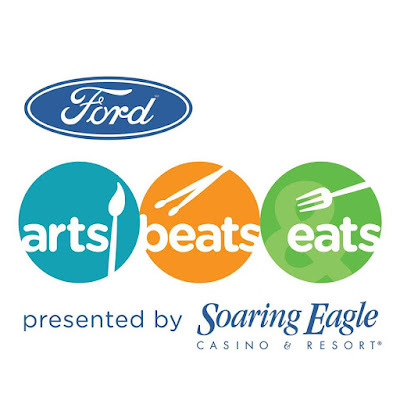 Of course Arts, Beats & Eats wouldn't have its name without the eats! A ton of great area restaurants are participating in this year's event. Some of the names that stuck out on the list are Woodpile BBQ, bd's Mongolian Grill, Lockhart’s BBQ and Treat Dreams. See the full list of "eats" here. The festival kicks off on Friday, September 2nd at 11 a.m. and runs thru Labor Day. The event's hours are Friday-Sunday, September 2nd-4th from 11:00 a.m. - 11:00 p.m. and Monday, September 5th from 11:00 a.m. - 9:30 p.m. Admission free until 5 p.m. on Friday, $3 before 3 p.m. throughout the weekend and $5 after 3 p.m. every evening. The festival takes place in Downtown Royal Oak between 11 Mile and Lincoln, with Washington Ave. running through the middle of it all. For more information on the event, to check out a map, and to find out where to park, head to ArtsBeatsEats.com. Get a better idea of what to expect at this year's Arts, Beats & Eats in this highlight video from last year's event, made by our friends at M-1 Studios! Ford Arts Beats & Eats 2015 Presented by Soaring Eagle Casino & Resort - The Eats! from M-1 Studios on Vimeo. Take a Tour of The Detroit Library Tonight! 24 Hour Giveaway: Win Tickets to See The Bronx!!! Do Not Eat At The Owl!! Summer's Not Over Until We Dally In The Alley!